It can be one of the most annoying problems with Windows – you’re happily browsing the web or working on a document and suddenly up pops the “low-memory warning”. Find out what causes this problem and how to fix it. Low memory warnings happen when Windows has run out of space to put the data it needs to store when you’re running different applications. This can be either in the RAM modules in your computer, or also on the hard disk, when the free RAM has been filled up. Typically if you’re getting these warnings, something has gone wrong with the paging file that uses your hard disk for extra storage. You can check this by opening the Performance tab of Windows Task Manager (press the Ctrl-Alt-Del keys simultaneously). The page file is almost full – not good! If your page file usage is almost full, and the Free memory is low, then Windows is running out of memory for your running applications. This can cause things like web browser crashes, other program crashes etc. First, check that you have enough free disk space.You can usually do this by clicking on Computer from the Start Menu, and then looking at the free space value to the right of Local Disk. If this is lower than a few hundred MB, then you need to free up space on the disk by deleting files, and then emptying the recycle bin. This will free up disk space for the paging file to use. The “Performance options” page will open. Click on the “Advanced” tab. Usually you can tick the top checkbox for “Automatically manage paging size..” and Windows will handle everything itself, as long as you have enough free disk space. However, you can keep this checked off if you have reasonable values set here. What are reasonable values here? Most of the time, you won’t need to use manual settings for virtual memory. However, there are some outlying cases where it might be useful. One of these might be where you have a limited amount of disk space, and don’t want the available free space to be increasing and decreasing all the time as Windows adjusts the size of the paging file. 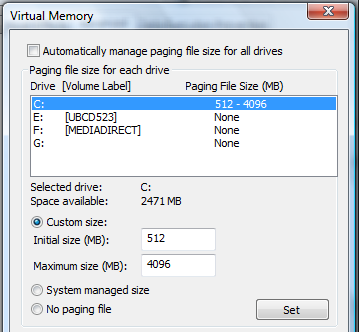 Unless you have a lot of memory (at least 8GB) and are using a 64-bit version of Windows, then you should have at least one disk set to use a paging file. This will typically be the C: drive. You don’t necessarily need to set a paging file on more than one disk, although it’s possible. Recommended minimum size is 512MB for compatibility reasons. The Maximum size is a matter of preference, and depends on how many applications you run at the same time, but it’s probably better to set it to at least 4096MB (4 Gig) or higher. Using both a SSD and standard hard drive in the same computer? Moving the paging file to the SSD disk can greatly speed up your system, since page file access can be one of the most frequent reasons for read and write usage of the disk. This is especially true if you don’t have that much physical RAM installed, or your disk light is frequently lighting up due to disk page file swapping. There was some concern with earlier SSDs that putting such a highly-used file on the SSD would lead to a shorter lifespan for the solid-state disk, however this is unlikely to be a concern for newer SSDs and the performance boost could be significant. Once you’ve either freed up disk space or adjusted your page file settings, you can start the Task Manager again to see what’s happening. 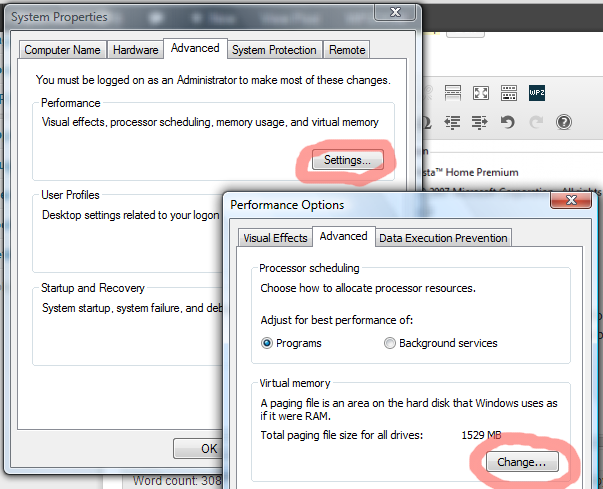 Note that you might have to reboot your computer before doing this if you have changed the virtual memory settings. Try to start using something that uses up memory, such as a web browser session with a lot of open tabs. If it appears that your page file space is not being exhausted, and you don’t get any popup error messages, then the problem is solved. To prevent low-memory problems reoccurring, make sure to try to free up enough space on your disk if it’s running low. Iit’s interesting that the comments before me are also in the fall of 2014. It’s nice to know I’m not the only one working with a Stone Age computer/program. I haven’t tried this “fix” yet, but I am trusting it will work. Thanks! Is there a way to expand that memory? Aside from taking it to a Geek Squad or other expensive option. Thanks! It depends on the model of your computer or laptop. If you have the model number you can post it here. Still getting the message after your instructions but a little less frequent. I tried the steps suggested here but it didn’t work. It says to close or delete files but I’m unclear on what files to close or delete. There are files that I’m not sure if I were to close or delete them if they are something I needed (I’m not completely computer illiterate but I’m not the best with it either). Have you tried using the CCleaner program mentioned in the post? It should do a good job of finding unnecessary files and cleaning them to free up space. Just uncheck any “Applications” listed in the CCleaner settings dialog as suggested above if you don’t want it to affect browser bookmarks etc. Where does the post mention a CCLEANER? Thank you so much for the advice hope it’s work… 🤗🤗🤗 More power.